The Keysight 53131A is available to buy refurbished used or rent, usually from our UK stock. Click here to download the Keysight 53131A datasheet. Frequency, period, ratio, TI, phase, duty, rise/fall, pulse width, totalize and peak volts measurements. Real-time digital signal processing technology is used to analyze data while simultaneously taking new readings, speeding measurement throughput. The technology, developed for Agilents high-end line of modulation domain analyzers, allows the counters to gather more data for each measurement, so you get higherresolution measurements in a fraction of the time it takes other counters. The 53131A/132A/181A counters offer built-in statistics and math functions so you can scale measurements and simultaneously measure and track average, min/max and standard deviation. Automated limit testing lets you set upper and lower limits for any measurement. An analog display mode lets you see at a glance whether a measurement is within pass/fail limits. The counters flag out-of-limit conditions and can generate an output signal to trigger external devices when a limit is exceeded. For quick access to frequently used tests, a single keystroke recalls up to 20 different stored frontpanel set-ups. For computer-controlled systems applications, each counter includes a standard GPIB interface with full SCPI-compatible programmability and a data transfer rate of up to 200 fully formatted measurements per second. The standard RS-232 talk-only interface provides printer support or data transfer to a computer through a terminal-emulation program. The two-channel 53131A counter offers 10 digits per second of frequency/period resolution and a bandwidth of 225 MHz. Time interval resolution is specified at 500 ps. An optional third channel provides frequency measurements up to 3 GHz, 5 GHz, or 12.4 GHz. Standard measurements include frequency, period, ratio, time interval, pulse width, rise/fall time, phase angle, duty cycle, totalize, and peak voltage. For applications requiring higher resolution, the 53132A offers the same features and functions as the 53131A, with up to 12 digits/ sec frequency/period resolution and 150 ps time interval resolution. In addition, the 53132A offers advanced arming modes for time interval measurements. Optimized for RF applications, the single-channel 10 digit/s 53181A measures frequency, period and peak voltage. A digit blanking function lets you easily eliminate unnecessary digits when you want to read measurements quickly. For higher-frequency measurements, choose an optional second channel that provides measurements up to 1.5 GHz, 3 GHz, 5 GHz, or 12.4 GHz. A self-guided shallow menu makes this counter exceptionally easy to use. 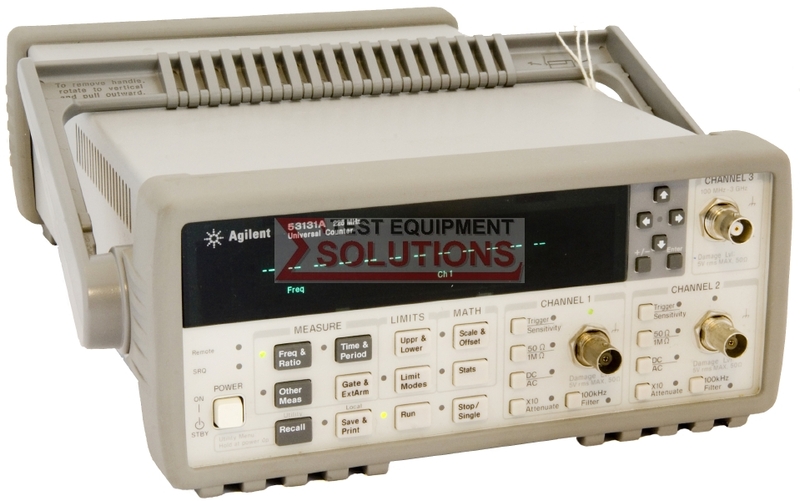 We offer the refurbished used Keysight (Agilent) 53131A 225MHz 10 Digit Universal Counter for sale and rental. The Keysight 53131A is fully tested and refurbished in our in-house ISO9001 calibration laboratory. We supply manuals, accessories, full warranty and a free-of-charge Certificate of Conformity. We can also provide the Keysight 53131A with a fresh calibration for a small additional charge. If you have under-utilised test equipment talk to us about trading-in or part-exchanging it towards the Keysight 53131A or other refurbished test equipment.